The posterior cruciate ligament is a very strong structure located in the middle of the knee. 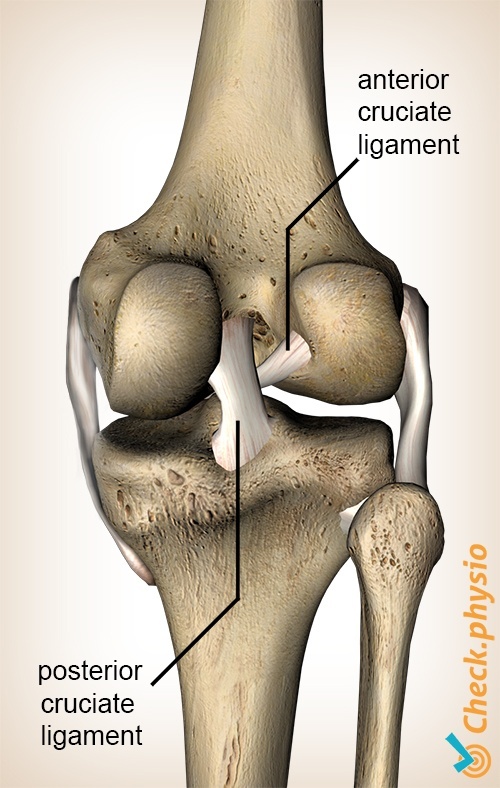 This ligament only tears under extreme forces and will result in instability of the knee joint. However, most cruciate ligament injuries involve the anterior cruciate ligament. There are two cruciate ligaments in the knee: the anterior and posterior cruciate ligament. Both connect the upper leg to the lower leg and play an important role in maintaining the stability of the knee joint. The posterior cruciate ligament prevents the lower leg from moving too far backwards in relation to the upper leg. It also prevents the knee from over-extending. If the posterior cruciate ligament is damaged, these movements are no longer restricted and the knee becomes unstable. A typical cause of posterior cruciate ligament injury is the so-called "dashboard injury". During a frontal collision, the dashboard hits the lower leg from the front whilst the knee is bent. This can tear the posterior cruciate ligament. Over-extending the knee can also cause damage to the posterior cruciate ligament. Over-extending or a small tear of the cruciate ligament can result in minimal symptoms. If the cruciate ligament tears completely the symptoms will be more pronounced, but still hard to distinguish from an anterior cruciate ligament rupture. In the case of a complete rupture, the entire cruciate ligament tears off. This can be accompanied by a popping or snapping sensation in the knee. The knee can start to swell immediately after the injury due to bleeding in the joint. This can cause a feeling of instability when walking on stairs, or a painful knee when landing on the heel whilst walking. People recognise a feeling of not being supported by the knee. In some cases the knee can lock. The instability in the knee can result in various other injuries through over-exertion of the surrounding structures. Depending on the severity of the injury, one can opt for physiotherapy or surgery. Surgery will only be performed if severe instability occurs and the posterior cruciate ligament is actually ruptured. This can be confirmed by means of an MRI or arthroscopy.